Born and raised in Yakima, Washington, I graduated from the University of Washington in 1991 and began working in Nordstrom's cash management and sales audit division. After more than a decade there, I decided I wanted to try working someplace smaller, where I could have more of an impact. A friend offered me a job in the finance office at United Indians of All Tribes Foundation, a Native American cultural and social-services organization also based in Seattle. Housed in the Daybreak Star Cultural Center in Seattle's Magnolia neighborhood, UIATF has many social programs, such as a facility for homeless youth, a preschool for low-income families, and the Ina Maka family visiting program. It also offers cultural events, including the annual Seafair Pow Wow. Whenever people ask me about the best part of working at United Indians, the answer is always “the people.” It always amazes me how many talented, hard-working and caring people are willing to devote so much time and energy to people and programs they care about. From my role in the finance office, I also learned a lot about the financial challenges that so many nonprofits face, impacting their ability to offer programs and services, hire staff and even raise funds. At the board and executive level, leaders must focus on achieving long-term financial stability so the rest of the staff can focus on delivering programs and services. My first week at Philanthropy Northwest I was in a meeting where someone on staff started talking about bridge loans for nonprofits and I wanted to yell, ”Yes! They need bridge loans!” My next thought was of the risk involved in loaning money to small organizations. I hope my experiences working at both a large corporation and a small nonprofit can bring valuable perspective to Philanthropy Northwest’s network. Now the story about a dinosaur: I’m an amateur paleontologist and I spend a lot of my free time looking for fossils. Jason Love, a friend from my University of Washington days, and I taught ourselves a lot about finding and identifying fossils on the beaches of central Oregon. We decided to go to eastern Montana and look for dinosaur fossils in the early 2000s. For the first five years or so, it was mostly misadventures with cows, rattlesnakes, canoes and thunderstorms! We gradually got better, however. Our fortunes really changed in 2014, when we were scouting (anyone can hike on Bureau of Land Management land, but only professional paleontologists can dig and collect) some patches of badlands in remote eastern Montana that seemed untouched by anyone and were thick with fossilized bone. While searching the patch in 2015, we found a sandstone block with an impression of a Thescelosaurus spinal column — the best thing we had ever found. At the end of the trip, we found a weathered block of sandstone with honeycombed vertebrae poking out — a sign that the animal may have been a therapod. But the bones were incredibly weathered and rough; most likely they were just isolated fragments. 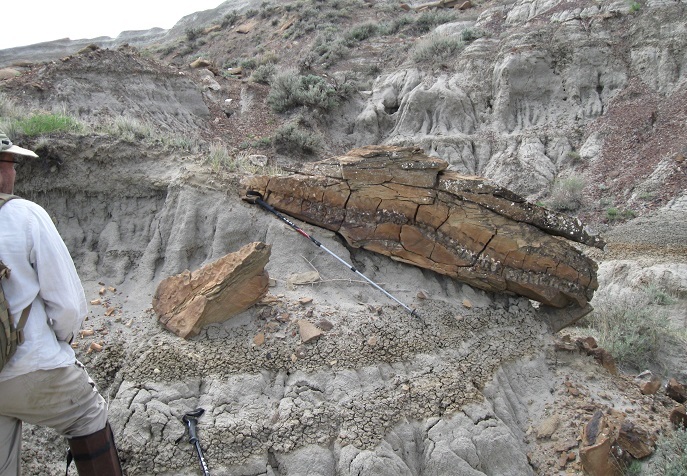 Getting a closer look at the Thescelosaurus block in the field. This summer, the Burke Museum field team was able to prep and excavate the Thescelosaurus block. In July, they decided to give the therapod site a try. It succeeded more than anyone hoped, and it looks like an entire Tyrannosaurus skull may have been found, along with ribs, vertebrae and part of the hip. They hope to find even more bones next summer. This project shows what can happen when government, the private sector and volunteers all work together. The fossil was found on federally managed land. Jason and I are volunteers working with the University of Washington. The team excavating the Tyrannosaurus — it will take hundreds of hours to remove all the bones — is comprised of Burke Museum and University of Washington staff, students and volunteers. The Burke Museum's field team is funded both publicly and privately. With luck, all the work of these groups will result in our "Tufts-Love Rex" fossil on display in the new Burke Museum in 2019. I hope this story touches on some of the values of Philanthropy Northwest’s Strategy Framework, such as cross-sector networks, honoring our past, and the ability to assess and learn from results. I look forward to contributing to my community, both as a member of Philanthropy Northwest and with my volunteer work. Luke Tufts is Philanthropy Northwest's new bookkeeper. He can be reached at ltufts@philanthropynw.org.